Palliative Care is now the most visible social movements in Kerala thanks to the efforts of Pain and Palliative Care Society in Calicut. From a one room clinic by the anaesthesia department in Calicut Medical Collegein 1993, palliative care has grown organically into a movement that has more than 8000 volunteers in action at any point of time mainly in the Malabar region of Kerala. 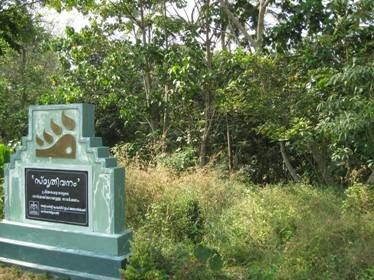 While entering the main campus of Institute of Palliative Medicine, there is a green patch known as “Smritivanam", a wood dedicated to the memory of dear ones. This was initiated by Forest Protection Staff Association, the trade union of forest protection staff six years ago. What kind of profile rae u looking for about a volunteer_ do I need to be a doctor? nursring staff? "The Blue Yonder has been offering Responsible holidays since early 2004 in India. An initiative that was set up to bring in attention of the world into a sadly depleted River Nila ( Bharatapuzha) in central Kerala is now the flag-bearer of Responsible Tourism movement in the country. Based in the city of Bangalore, TBY now offers unique holiday experiences in Himachal Pradesh, Sikkim, Rajasthan, Kerala and Karnataka. Covering three primary areas of People, Culture and Wilderness, our holidays are designed in a way that it is economically, socially and environmentally just. While practising RT, we have been building partnerships across the world to "create better places for people to live in and visit". The content of this blog is an attempt to put together some of our initiatives."